Marbella is more associated with classy boutiques than it is with second hand shops and markets. That said, the city is home to some fantastic places to hunt for bargains. 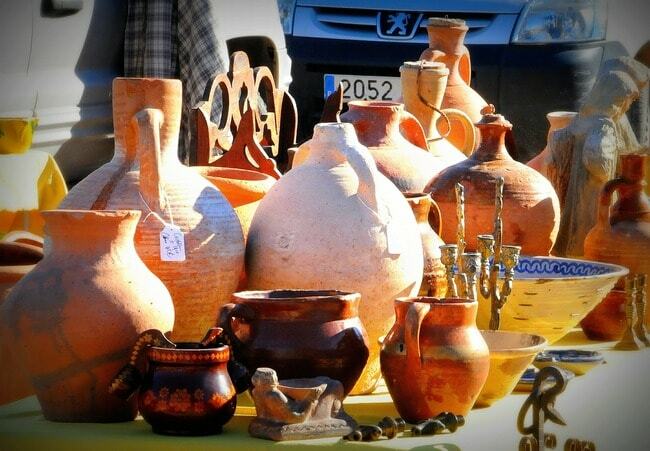 Below you’ll find our selection of the best flea markets and thrift stores in Marbella. One of the biggest flea markets – or rastros, as they’re called in Spanish – is held on Saturday mornings in Puerto Banús, a flashy marina 8km (5 miles) west of Marbella. It takes over the area near the bullring, with vendors selling a bewildering array of wares – from golf clubs to mirrors, paintings to pianos. Prices are competitive and you can always practice your haggling abilities if you think something’s too expensive. At the Cudeca Hospice Charity Shop, you can find unworn items of clothing (labels still on) for a fraction of their original price. It’s also a great place to come just to ruffle through the second hand book shelves, or see what household items have turned up lately. The shop is staffed by friendly English-speaking asisstants and is located by the seafront, opposite the Salvador Dali sculptures. Marbella’s Monday morning street market is held on the eastern side of the city from 9am until about 2pm, when the vendors head off for lunch. More than 350 stalls offer clothing, ornaments and crafts as well as fresh fruit and vegetables, and locals say the prices here are cheaper than those at Marbella’s other street markets. When you’re done shopping, head to the makeshift bar near the entrance for refreshment. Located amongst the designer boutiques of Marbella’s old town, Vintage Deja Vu is an alluring grotto of second hand and “semi new” goodies. Beautifully displayed in its interior is a varied stock – from furniture and glassware to clothing and accessories – as well as items by designers such as Gucci and Hermes at knock-down prices. The kind of shop that is virtually impossible to leave without making a purchase. Well worth a visit for clothes and jewellery at reduced prices is the flea market that’s held near Marbella’s old town hall every Friday morning. Though a fairly small rastro in comparison to the others featured here, the Las Chapas market’s central location makes it a convenient stop-off when you’re sightseeing in Marbella. Fruit and vegetables are also on sale. This is a spacious and well-stocked charity shop in the centre of modern Marbella. Unlike the cluttered interiors of many such outlets, Piel de Mariposa‘s is laid out in such a way that browsing is a pleasure; a little hunting will soon take you to a good-as-new item of clothing or a book you’ve been meaning to read for ages. Nothing is too much trouble for the friendly staff, either. 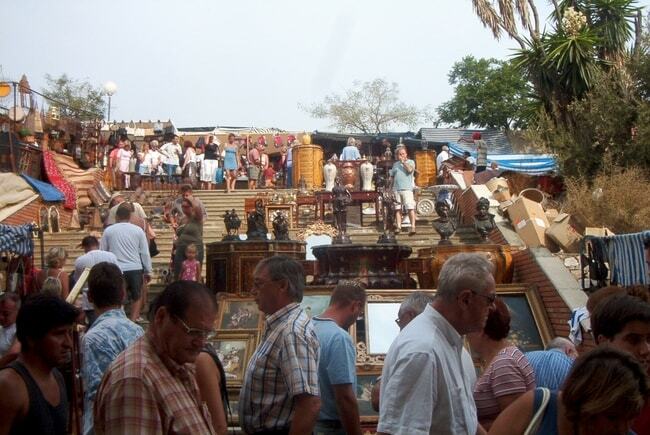 On Saturday mornings during Marbella’s off-season, Puerto Banús hosts not one but two superb flea markets. 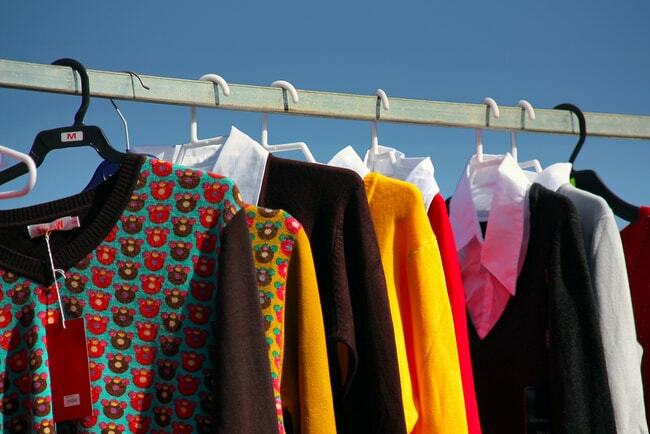 The Zoco del Sol rastro can be found on a square named after Andalusia’s most famous actor (Antonio Banderas) and sells vintage clothing alongside accessories, pottery and ceramics and household items. During summer, the market is open every day from 11am until midnight.